Thanks for doing the live stream, that was interesting. I left it running but wasn't able to catch the whole thing as I had to leave my computer a few times, so I didn't ask much in the chat. I'll definitely come up with some hard hitting "gotcha" interview questions for the next one, if you do another! I'm surprised that whole screen is not filled with spoiler alerts! Is there a way to watch it for those who missed it/had no time? Hahahha, that's awesome. 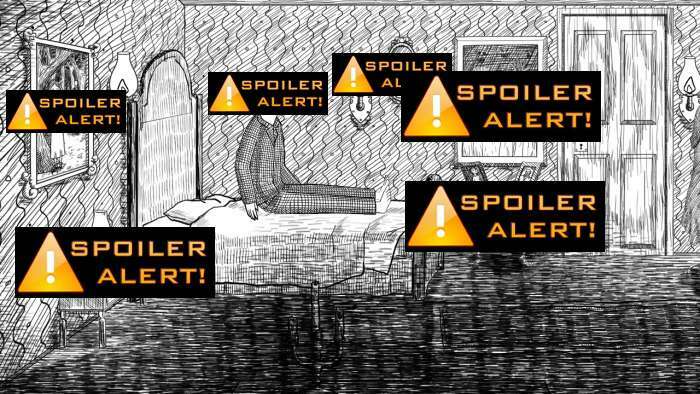 I think you need a few more spoiler alert signs. I think we need a painting of animal heads in a graveyard in the final release. Or at least a painting of tombstones in an inappropriate location. This must be immortalized. Awesome! Thanks for drawing it. I love fan art! zohaa wrote: Awesome! Thanks for drawing it. I love fan art! This post is really weird, it's the exact thing you said in another thread a while ago Matt, I went ahead and approved it because it doesn't look like spam but I don't know what's going on with it and it doesn't make sense. If you are a real person zohaa maybe you could explain? Huh. That is indeed strange. I was left pretty confused by the post since I didn't consider the spoiler alert quite fan art, but you are right that I said that. Weird! from moderating on an active board a while ago My guess if Zohaa doesn't reply is that it is a tactic where they create an account and pepper the place with generic posts across multiple threads, then a few weeks later they change the signature field to a spam/advert link as by then no one pays attention to old posts, and they're hit counter goes up significantly for that site on search engines. if you as admins search all active accounts that have a signature file, and scan those with embedded links, you may be surprised how often this happens. back then, I would routinely do a scan every month and delete/flag the accounts for Ban hammer. And that was also on a phpBB site.